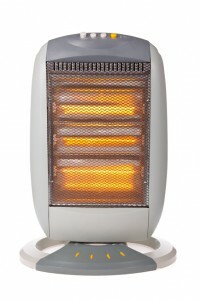 Place an electric space heater in your home office such as the radiant heater shown here. That way you can maintain a lower temperature in the rest of the house during the day – at least until the kids come home. Electric resistance heating is the most costly way to heat your home. In fact, it’s more than twice the cost natural gas per BTU. So it may seem counterintuitive to hear that using electric space heaters can lower your heating costs. Placing a heater in the rooms where you live, however, may allow you to lower the heat in the rest of the house. In effective, the electric heaters allow you to create heating zones in your home. If the family spends evening hours in the family room, for example, place an electric heater there. Then lower the thermostat for your central heating system. You’ll likely save some money. How much will depend upon the size of your house and how low you set the thermostat. If you heat your home with fuel oil, it’s very likely you’ll save money!